Paris’s seventh arrondissement is justifiably celebrated for its soigne collection of fine dining establishments and grandly graceful architecture, not least of which are the Champ-de-Mars and the Esplanade des Invalides. It’s also the epicentre of the city’s ministerial blue-bloods – the National Assembly is nearby – and posh residences of army generals, one of which is now the stately address of the newly opened Le Narcisse Blanc. The designers Laurent Bardet, Laurence Jean, Thierry Martin and Thibaut Fron have conceived a lush cocoon of soothing hues of cream, mauve, gold, black and the titular white flower – an impeccably tasteful homage to Cléo de Mérode, the ballet dancer who was supposedly a muse for the likes of Degas and Proust. Each of the 30 rooms and seven suites is configured differently and, like the bright garden conservatory on the ground floor, features high ceilings, natural light and unexpectedly spacious proportions. 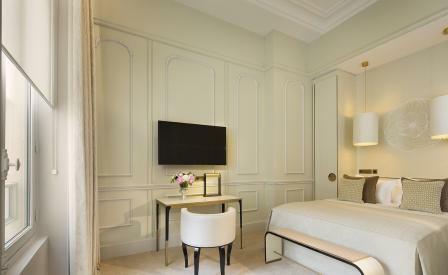 The best rooms hold court high on the fifth floor with partial views of the Eiffel Tower peeking over the neighbourhood’s elegant mansards. The biggest surprise though is the basement which features an expansive all-white 12m pool, whirl pool, steam room, sauna, and Carita treatment rooms – a therapeutic bounty one normally associates with a larger hotel and all the more special for it.